What are the main differences between these two? I am looking at 2 bikes and one has the Apex group and one has the Rival and both are within 50 bucks of each other. Would I notice the difference between the two groups? Depends on your ultimate end use I would say. If you plan on taking on MTB trails or riding roads with long steep hills, I'd go with the Apex group for the wider gearing. If you're just going to race and mostly flat-ish area, Rival would be the way to go. Now, between the two you had selected, I'm partial to the Airborne bike because they are an Ohio company. That said, I am sure the frames aren't really made here, just spec'ed and then sold from Ohio. BUT, are you partial to disc brakes? IF you plan on racing and having at least a wheelset or two to swap in, you may be stuck getting more disc wheelsets unless you have lots of cash. The Motobecane sure enough looks like my Fuji BUT it doesn't have that diamond-shaped down tube so the frame is probably 3 or three years behind. Not a big deal in any event really. May be a benefit really, depending on how you feel about the diamond-shaped downtube. I have Rival on my road bike. Works great, no complaints. Apex offers a wider gear range than standard double-chainring setups. This is most useful for hill hunting. Apex is a bit heavier than Rival, but both have a good rep. So both are good bikes for the price with well thought out components for cyclocross. 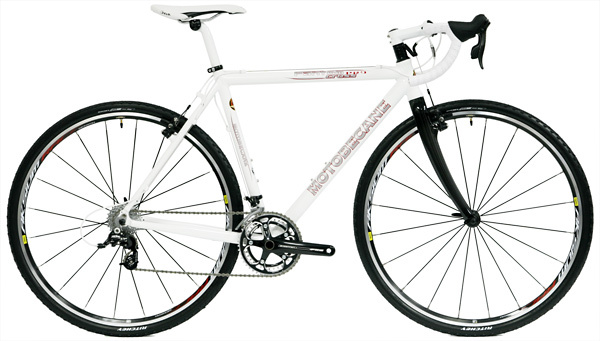 The bikesdirect is often referred to as a rebranded previous year Fuji model. As a side note, on my bike I swapped in Wickwerks 46/36T chainrings. I have not tried out the technology in mud and CX mag will have an indepth review. That said, my front derailler acts like it is possessed -- really responsive and looks great too! Not sure what you mean by internals. I am trying to decide between these 2 bikes. I really want disc brakes but also good components. It's between these 2. Thoughts? From what I have been told, the only difference between the two are the internals. The Rival have a little bit nicer internals than the Apex. I would go for the better of the two.